Maximize your wall space using the 4" White Slatwall hooks from Store Supply Warehouse! The Slatwall hook will help to maximize the space and usability of your Slatwall display, because it expands outward with a 4" reach, allowing you to stock smaller products in a neat and orderly fashion. The white finish will match almost any color slatwall, keeping your display setting subtle and attractive. 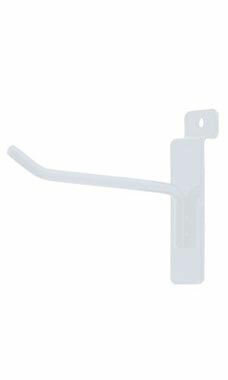 With the lowest price guaranteed, the 4" slatwall hooks are a must have for any retailer. In stock and available for immediate shipment. Perfect fit for my display. Love the color and perfect length. I use these hooks for all types of merchandise. Fast shipping. These 4" hooks are just the right size for displaying my jewelry items. I appreciate the great price and fast delivery service. Thanks! These 4" hooks work great in the slatwall panels to hang merchandise on display. Very good size! Luv the white coating. makes everything look clean.